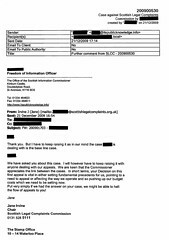 SLCC Chair Jane Irvine secretly lobbied FOI Commissioner’s office to produce favourable investigation results. 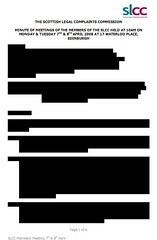 DOCUMENTS REVEALING A SECRET WORLD of public bodies directly lobbying the Freedom of Information Commissioner Kevin Dunion and his staff to produce favourable outcomes against FOI requests from the media, amid expectations of transparency & public accountability through the use of FOI legislation, have exposed attempts by Jane Irvine, the Chair of the Scottish Legal Complaints Commission to pressure the Information Commissioner’s office over the results of several critical investigations carried out into FOI appeals against the SLCC’s refusal to disclose information on its now highly questionable role of investigating complaints against Scotland’s legal profession. Scotland’s Information Commissioner Kevin Dunion’s office was pressured by SLCC. 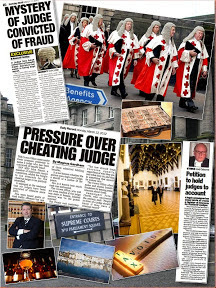 The controversial cases being investigated by the Information Commissioner which provoked such a storm at the Scottish Legal Complaints Commission’s headquarters at the Stamp Office, Edinburgh, eventually leading to demands of direct meetings between the SLCC Chair, Jane Irvine & FOI Chief Kevin Dunion, related to heavily censored Board meetings minutes of the SLCC during 2008, when the law complaints quango was publicly funded to the tune of a whopping £2 million while its Board Members claimed a staggering £130,000 in expenses from the public purse, and also included issues surrounding the SLCC’s Master Policy research, carried out in mid-2009 which linked client suicides to claims against the Law Society’s infamous Master Policy insurance scheme, which is supposed, but fails to compensate victims of ‘crooked lawyers’. 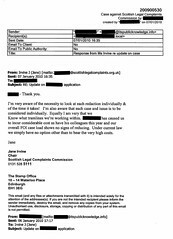 A further email from Jane Irvine to the Information Commissioner’s staff also alleged the SLCC had “involved legal advisors” in compiling FOI disclosures & responses to the Information Commissioner’s office. However things were to take a more direct turn as papers now reveal Jane Irvine insisted on a meeting with the Information Commissioner over his office’s investigations of the SLCC’s FOI disclosures. 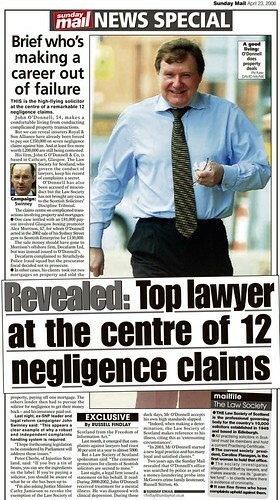 A legal insider studying the papers released from the Information Commissioner’s office was of the opinion the Scottish Legal Complaints Commission had attempted to pressure the Information Commissioner and his staff for outcomes of their investigations which would be favourable to the SLCC. 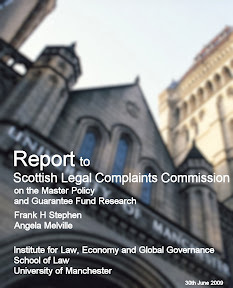 The Scottish Legal Complaints Commission and its Chair, Jane Irvine, refused to give any comment or explanation for their attempt to lobby the Information Commissioner on the investigations involving the SLCC. However, a legal insider close to the law complaints quango claimed late last night the SLCC had now embarked on “a policy to delay, prevaricate and refuse further Freedom of Information requests it considered may be damaging to its operations”. This latest claim seems to support a recent slew of decisions by the SLCC to intimidate journalists making requests for information as to whether they are requesting it on their own behalf or for someone else. Curiously, the SLCC is also now operating a policy of terming many FOI requests as “vexatious” even if the subject matter requested has only come to light through the Information Commissioner’s own investigations. 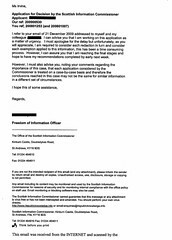 However, this latest attempt by the SLCC to stall the flow of information into the public arena will doubtless only result in more appeals to the Information Commissioner’s office, something the SLCC Chair, Jane Irvine, was keen to prevent as she expressed in her emails to Mr Dunion’s office. 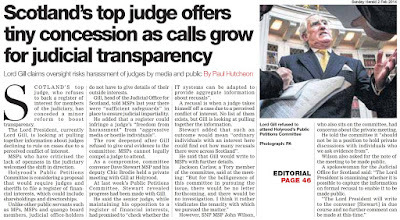 Given we are now at the stage where the Scottish Legal Complaints Commission feels it must manipulate Freedom of Information legislation to protect its secrets, it must now lose any lingering trust of consumers forced to approach it over complaints against the legal profession. 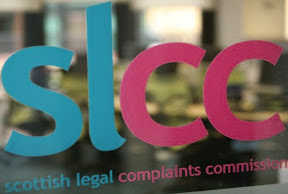 It is now time to call time on the grave mistake the SLCC has turned out to be, and give Scots consumers the level of protection which only a fully independent regulator of legal services can provide. Law Society’s latest constitution consultation is viewed by solicitors & clients as attempt to consolidate power at the top. SCOTS CONSUMERS OF LEGAL SERVICES are again effectively being thrown to the sharks in the latest consultation exercise organised by the Law Society of Scotland, billed as an attempt to reform the solicitors governing body’s constitution, but more darkly revealed to be little more than the latest attempt to shore up the Law Society’s powerful position as self regulator of Scotland’s 10,000 plus solicitors, along with its ‘dual role’, mandated in the Solicitors (Scotland) Act 1980 of representing the client’s best interests – the latter duty of which the Law Society is infamous for failing to carry out in any shape or form. The Law Society launched the consultation earlier in June, asking its members for their views on a revised constitution and its standing orders. The Law Society claimed its constitution “is being updated as part of a review and modernisation of the Society’s procedures to enable the Society to better represent and support its members”. However, and perhaps more dangerous from the consumers point of view is that the changes proposed by the Law Society, will, in its own words, “allow the Society to adapt to changing conditions in the future, without having to resort to further legislative change” – thus escaping any legislative scrutiny in the elected Scottish Parliament of changes which many expect will be counter to the consumers best interests. The Law Society dressed up its proposed changes to the constitution as “measures which will also ensure that the Society is well placed to become a regulator of those wishing to adopt alternative business structures as defined by the Legal Services (Scotland) Bill once passed”. Clearly the Law Society wishes to regulate just about every aspect of Scots legal life … much to the danger of fee paying clients, who, once the Legal Services (Scotland) Bill is passed, will continue to have as little protection against poor legal services in the future, as is currently, and historically been the case in Scotland. Is your lawyer crooked ? Chances are the answer could be “Yes” but you’d never know it ! 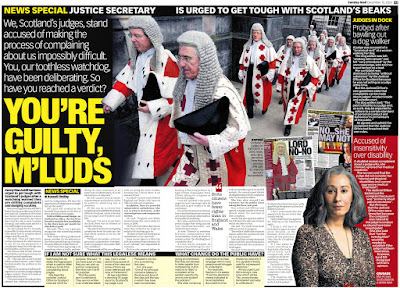 As far as the Law Society representing the client’s best interests, anyone who has been put in the position of being forced to make a complaint about their solicitor to the Law Society of Scotland, or the hapless Scottish Legal Complaints Commission will probably by now, realise the futility of their position, where from the outset, their complaint, no matter its seriousness, had been treated by the Law Society with disdain, ending in up in a grand paper chase, sometimes lasting years, where often the solicitor being complained against escaped any punishment for their crimes or actions against clients. 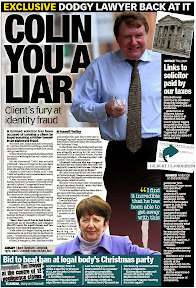 The Law Society of Scotland did not represent the interests of ‘crooked lawyer’ John G’O’Donnell’s clients, considering Mr O’Donnell, and thousands like him are still working as solicitors. 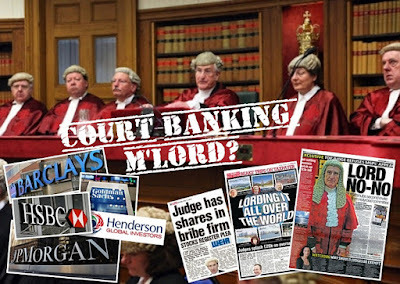 However, as the years have gone by, many consumers, consumer protection organisations, critics and even some sections of the legal profession have questioned & campaigned against the Law Society’s dual role of representing solicitors and clients, a dual role viewed by many as posing an inherent conflict of interest, where as countless media reports over the decades have documented, the interests of solicitors have always overshadowed any regards for client protection from the likes of the John O'Donnell's of the legal world, of which there are a growing number. The Law Society, seeing the flow of these reports, and our changing times where the word ‘regulation’ is now mostly viewed as another word for ‘cover up’ is simply trying to consolidate its grip on power with this latest ‘consultation’, ensuring it continues to be in charge of regulation and representing the clients ‘best interests’, because the Society and the profession well know, if it loses one role to the other, its grip over Scotland’s legal services market and the public’s access to justice is doomed. 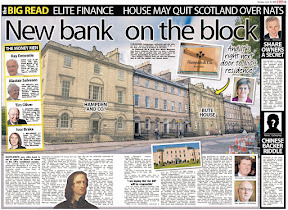 However, the consultation has drawn some criticism from some parts of the legal profession itself, with the Glasgow Bar Association highlighting the conflict of interest in Section 1 of the Solicitors (Scotland) Act 1980 where the Law Society represents both clients & solicitors. 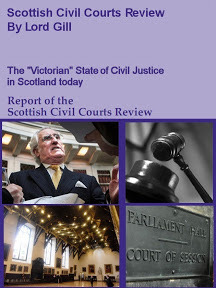 It should be borne in mind however, the criticism from the Glasgow Bar Association is from the point of view of protecting its member solicitors, rather than making ‘consumer protection’ paramount … perhaps an obvious point of view, given the GBA is the bar association for law firms on Scotland’s west coast. “The conflict is obvious and serves as a source of frustration to the profession. Solicitors, who currently pay over £1200 per year to the LSS (40% of which the LSS says is spent on "representation" of its members) cannot benefit from that representation in circumstances where their conduct is called into question, almost always on the basis of uncorroborated ex parte statements, by clients, former clients or members of the public. The individual solicitor is, in practice, left to his/her own devices. By contrast, the conflict which is embodied within s.1 of the Act, serves as a source of frustration to a public, rightly unconvinced that any such complaint can be fairly investigated, given that s.1 of the Act allows the very body to which the member of the public has complained, to "promote the interests of the solicitors' profession in Scotland". 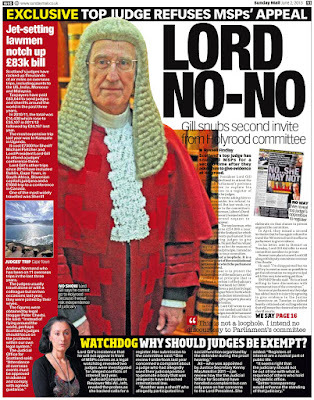 The GBA went on to attack the Law Society’s proposals for its newly created ‘Board’, which allows a more "senatorial" role for Council, claiming the ‘Board’ distances ordinary solicitors further from the Law Society’s decision making process and branded it a result of the elite culture existing within the Law Society of Scotland. He continued : “Particular concerns about motions passed at Council and whether the changes should be held until the Legal Services (Scotland) Bill has completed stage 3 will be addressed and I am grateful to those members and organisations who raised these points. I also welcome the feedback given at meetings with some individuals and groups who took up the Society's offer to discuss the proposals, possible improvements to the draft and concerns to be addressed. " 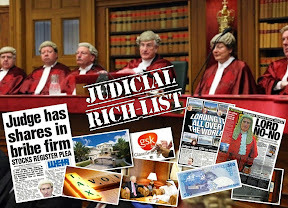 Law Society & SLCC are both unfit to regulate the Scottish legal profession, leaving consumers without any real protection against ‘crooked lawyers’. 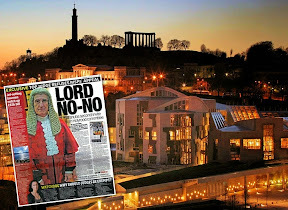 While the legal profession bickers with itself over changes which amount to little more than window dressing, clients of solicitors & consumers of Scots legal services can be assured no changes which may benefit clients over the interests of their solicitors will take place until the Law Society is stripped of its regulatory role over complaints, with the duties passed to a new fully independent regulator, one which should be far and above the anti-client Scottish Legal Complaints Commission, which is nothing more than a front company for the Law Society in protecting solicitor’s vested interests over consumers best interests. The Scottish Government refused invite to senate investigation. THE SCOTTISH GOVERNMENT have, as we all now know, refused an invitation to attend a US Senate investigation of Justice Secretary Kenny MacAskill’s decision to release Abdelbaset Ali Mohmed Al Megrahi, who was tried & convicted under Scots Law of the bombing of Pan Am Flight 103 over Lockerbie, Scotland in December 1988. Mr Megrahi was diagnosed with terminal prostate cancer, and allegedly given three months to live after his release in August 2009. While there is considerable furore on Scottish Minister’s refusal to attend the US investigation into the release of Mr Al-Megrahi, it shouldn’t come as much surprise that Ministers of State of one nation refuse to be questioned on live television over their own decisions by politicians of another nation’s elected assembly, no matter what the case at hand is. Would any other Scottish Government have done different ? I think not .. but then again, perhaps any other Scottish Government may not have released Mr Megrahi … or would they ? 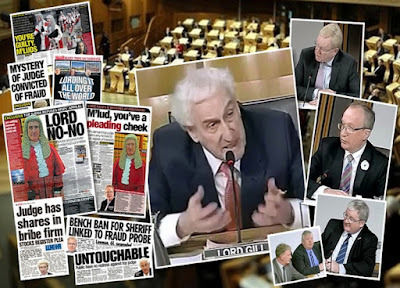 However, while the Scottish Government say they will not attend the Washington Senate investigation, the Scottish Parliament could send over a team, as Holyrood has already investigated the Justice Secretary’s decision to release Mr Al-Megrahi. To this end, Bill Aitken, the Convener of the Scottish Parliament’s Justice Committee for one, could travel across to the US and give testimony over the Justice Committee’s investigation into the release of Mr Al-Megrahi. Another MSP, Christine Grahame, who has questioned the validity of Mr Al-Megrahi’s conviction and the evidence it was based on, could also follow across the Atlantic to give her public account of issues she believes must be ‘put right’. 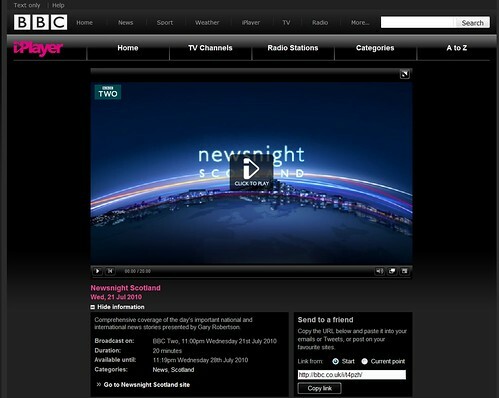 Viewers in the UK may be familiar with BBC Newsnight Scotland, who ran one of the most informative reports on the recent row over the release of Mr Al-Megrahi, and highlighted issues surrounding the actual conviction & trial, earlier this week. You can watch that show if you are in the UK, by clicking on the image below. Of course, while Mr Salmond & Mr MacAskill wont go to Washington, this shouldn’t prevent us having our own independent inquiry to establish the true facts of the Lockerbie trial because make no mistake, Scots deserve an inquiry into the Lockerbie case to establish just how honest the investigation & trial actually was, given the many questions over the evidence, testimony and how the conviction of Mr Al-Megrahi was arrived at by a jury-less Scottish courtroom set up at Camp Zeist in the Netherlands. Scottish Legal Complaints Commission prefers sending complaints against solicitors back to Law Society. 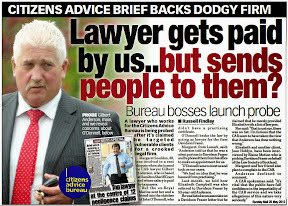 CLIENTS OF SCOTTISH SOLICITORS are less protected against ‘crooked lawyers’ now than they were before the ‘independent’ Scottish Legal Complaints Commission came into existence, say campaigners & consumer groups today as it emerged the bitter anti-client SLCC, which itself has now formed its own trail of victims, is still handing over complaints to the notoriously corrupt Law Society of Scotland in a policy which could alarmingly extend for yet another 10 years, depending on when legal business was first instructed by clients to their solicitors..
Law Society Regulation Chief Philip Yelland still receives most complaints about crooked lawyers. 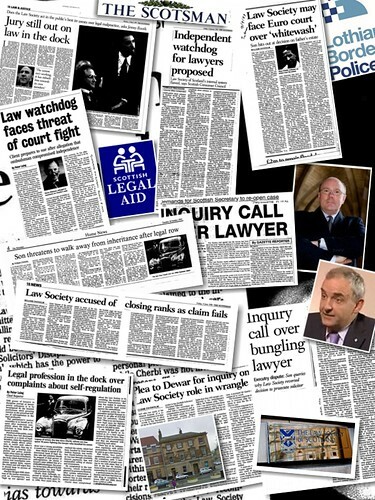 Huge numbers of consumers with complaints against their solicitors which involve legal work or matters instructed to solicitors before 1st October 2008 are still being told by the SLCC they will pass their complaint back to the Law Society, which was so corrupt in its handling of complaints against lawyers, it sparked numerous legislative attempts to reform the legal profession’s system of self-regulation into what was hoped would be a cleaner model in the SLCC. 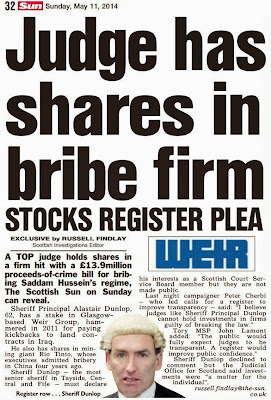 However victims of rogue lawyers are being treated just as poorly by the Scottish Legal Complaints Commission as they were under the Law Society’s complaints handling regime, headed by its Director of Regulation, Philip Yelland who has reigned over consumer complaints against crooked lawyers for twenty years. SLCC Board members voted against investigating complaints before October 2008, while making huge expenses claims. 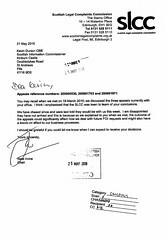 The letter is quite an effort from the Scottish Legal Complaints Commission – after receiving £2 million of public funds and well over £6 million from the legal profession, yet after several years of its Board members paying themselves an average of £135K expenses per annum (some with several paid jobs on other quangos), and its staff on salaries of up to £1350 per week, the SLCC can only manage to inform the majority of Scots their complaints against their lawyers cannot be investigated by the ‘independent’ law complaints quango as their legal work began in a time the SLCC want to avoid regulating, guaranteeing the SLCC is not forced in to compromising situations where it may have to investigate complaints deliberately mishandled by the Law Society of Scotland. An official from one of Scotland’s consumer organisations was asked for his reaction to the SLCC’s policy of passing complaints back to the Law Society. 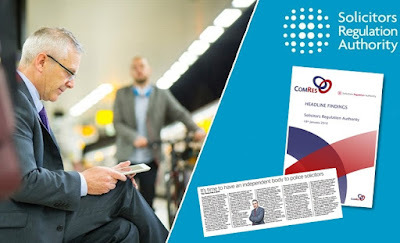 He attacked the terms of the SLCC’s ‘avoid the complaint letter’, branding it ‘an excuse to do nothing’, and condemned it as being ‘very anti-consumer and laden with untruths’. 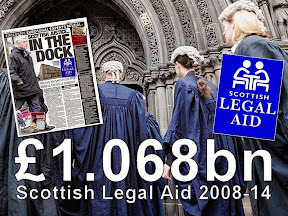 In the ORIGINAL VERSION of the Legal Profession & Legal Aid (Scotland) Act 2007, the legislation which created the Scottish Legal Complaints Commission, laughably, to cure the ills of the Law Society of Scotland, there was no mention of the now infamous 1st October 2008 cut off for complaints relating to business instructed to a solicitor or advocate. So, as you all see, the ‘independent’ regulator which was created by legislation to cure the prejudiced, anti-consumer practices of the Law Society of Scotland’s self regulation of complaints against solicitors, has itself become as anti-consumer & prejudiced as the organisation and the profession it was designed to clean up. The SLCC is nothing short of a failure in terms of raising the levels of consumer protection against poor legal services, and a very costly, bitter, anti-client failure at that. 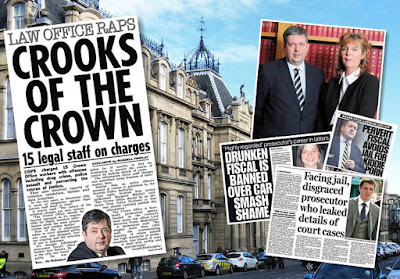 Scotland’s Crown Office appears to operate a policy of not prosecuting ‘crooked lawyers’. 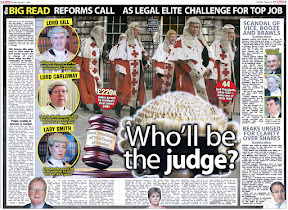 WHILE CLAIMANTS OF LEGAL AID in Scotland who lie on their Legal Aid applications may expect to be prosecuted by the Crown Office, given that defrauding the Scottish Legal Aid Board is a criminal offence, the Crown Office’s application of the law in this regard seems to be somewhat uneven, as the SUNDAY MAIL newspaper revealed this weekend in the case of solicitors IAIN ROBERTSON & ALASTAIR GIBB, who, despite being accused of submitting £223,000 worth of false claims for taxpayers' cash from the Scottish Legal Aid Board over an 18-month period, are not to be prosecuted. 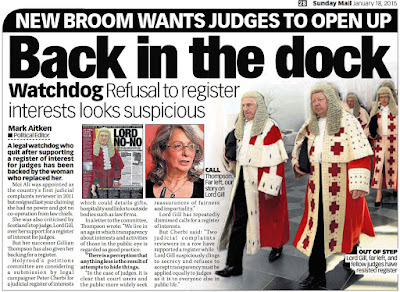 The Scottish Legal Aid Board reported both solicitors to the Crown Office for prosecution. 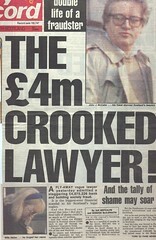 The latest failure of the Crown Office to prosecute ‘crooked lawyers’ comes after a string of cases reported in the media where solicitors have swindled Legal Aid, or acted against clients in a way where ordinary members of the public may well have been expected to be charged and prosecuted to the full letter of the Law. 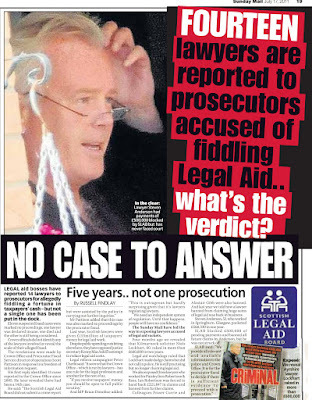 In the case of Iain Robertson & Alistair Gibb, the Scottish Legal Aid Board reported both solicitors to the Crown Office for prosecution, yet as revealed in the media, there will be no criminal prosecution against either solicitor – yet a member of the public who may have falsely claimed much smaller amounts of legal aid can certainly expect to be prosecuted to the fullest extent. The solicitor, Steven A Anderson of Andersons Solicitors, 2 Hillkirk Street Lane, Springburn Glasgow, G21 1TE and the firm of Andersons Solicitors. The solicitor, Iain Robertson, director of Roberston and Ross Limited, 7 Causeyside Street, Paisley, PA1 1UW and the solicitor, Alistair Gibb, a former associate of the firm, Robertson and Ross Limited. This means that these solicitors cannot now provide criminal legal aid or criminal advice and assistance. 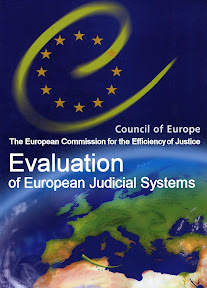 The removal follows investigations by the Board in relation to non‐compliance with the Board’s Code of Practice for Criminal Legal Assistance. For Andersons Solicitors this non‐compliance included: holding unnecessary meetings with clients, and making inappropriate, multiple and repetitive grants of advice and assistance. 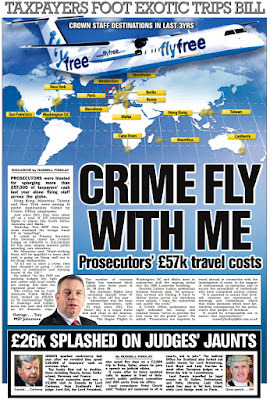 For Iain Robertson and Alistair Gibb, the non‐compliance included overcharging the Board for travel to various prisons. As a result of non‐compliance with the Board’s Code of Practice, the firm Robertson and Ross Limited has re‐paid to the Legal Aid Fund, the sum of £221,847. The Board has a substantial programme of monitoring and investigating legal aid expenditure involving both legal aid applicants and the legal profession. Under its powers, it can stop solicitors doing criminal legal aid work. 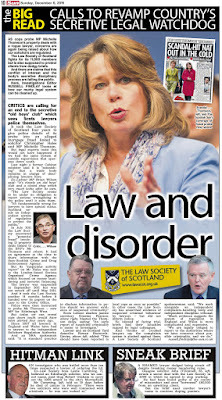 Only the Law Society of Scotland has responsibility for stopping solicitors from doing civil legal aid work. 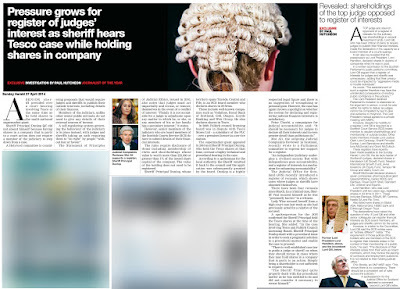 Where the Board has concerns about lawyers it can make formal complaints to the appropriate regulatory body (for example, the Law Society of Scotland or the Faculty of Advocates) and may also forward cases for consideration to the Crown Office Procurator Fiscal Service. In 2009‐2010, the Board’s compliance and investigations work resulted in savings and recoveries of nearly £2 million, and a number of cases involving solicitors, applicants and legally‐aided assisted persons were reported to the Crown Office. 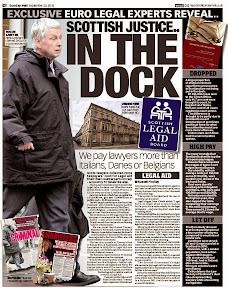 A LAWYER has escaped the dock - after handing back more than £200,000 of bogus legal aid claims. 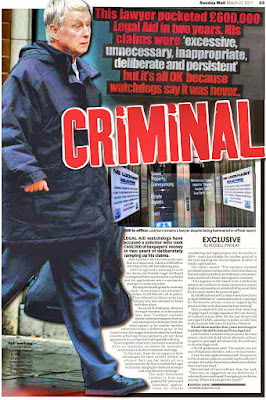 A criminal probe into Iain Robertson has been dropped after he returned £221,847 to the Scottish Legal Aid Board. Amazingly, Robertson is even allowed to continue claiming legal aid for civil cases while waiting to discover if he will be struck off. 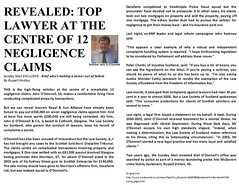 The scandal centred on the 57-year-old shamed solicitor and his firm Robertson & Ross in Paisley. 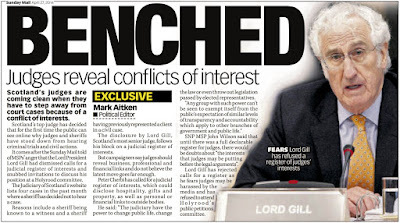 Another lawyer - Aberdeen-based Alastair Gibb - was also investigated. 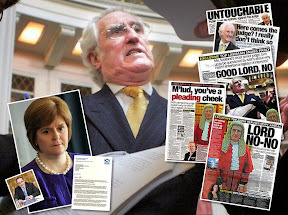 Scots Lib Dem justice spokesman Robert Brown demanded to know why Robertson is not being taken to court. 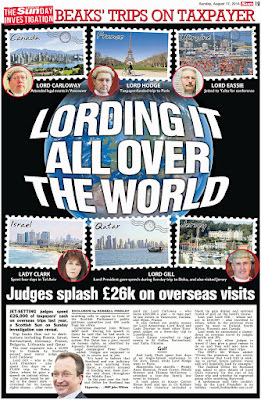 He said: "It seems that the Crown Office have some questions to answer as to why they didn't prosecute what appears to be a straightforward fraud involving a significant amount of money." Labour justice spokesman Richard Baker added: "This is a very serious issue and we should have clarity on why the Crown Office decided not to proceed. "The sum of cash is huge and I'll be interested to know why the lawyers involved haven't faced criminal charges." 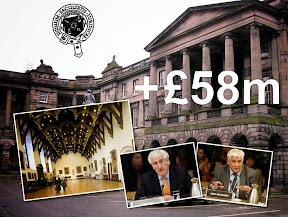 Robertson was accused of submitting £223,000 worth of false claims for taxpayers' cash from SLAB over an 18-month period. The claims were based on Gibb travelling thousands of miles from Paisley to see clients in Aberdeen and Peterhead prisons. In reality, Gibb was living in Kingswells, near Aberdeen. Earlier this month, Robertson agreed to pay have back £221,847 to SLAB and was banned from claiming criminal legal aid cash in the future. 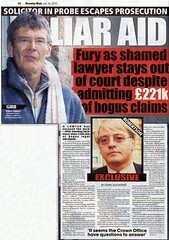 But he's still allowed to claim legal aid for any civil cases he undertakes. 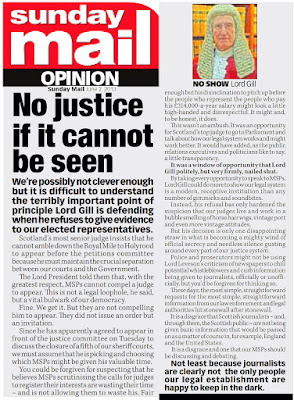 Gibb, 60, did not renew his certificate to practise as a solicitor with the Law Society of Scotland after SLAB called in police two years ago. Fraud squad detectives submitted a detailed report about the case to Crown prosecutors in April, 2008. But officials marked the case "no proceedings" and stubbornly refuse to explain their decision. Last year Robertson & Ross received £367,600 in legal aid compared to £832,000 between 2007 and 2008. Legal aid exists to pay fees for those who can't afford to hire a solicitor. Gibb claimed he was sacked by Robertson & Ross but was awarded a cash settlement by the firm before an unfair dismissal tribunal. He said: "What went on between SLAB and Robertson & Ross is totally outwith my knowledge, other than that I assisted SLAB once. I'm now 60 and don't have a hope in hell of getting a job now. I've been wiped out." 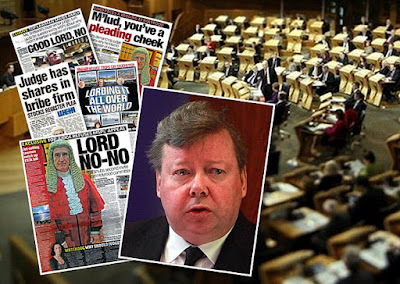 In December, 2008, Robertson was censured by the Scottish Solicitors' Discipline Tribunal for ripping off a client for £21,308. 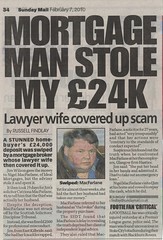 He took cash payments from the woman while claiming legal aid for the work. He was fined £5000 and found guilty of professional misconduct. A SLAB spokesman said: "Iain Robertson and Alastair Gibb have been investigated. The sum of £221,847 has been paid back." Robertson said: "It was accepted that payments had been wrongly claimed and as the supervising partner I had to accept responsibility. "We dealt with the matter and agreed the figures. I'm disappointed that SLAB have taken the decision they have." 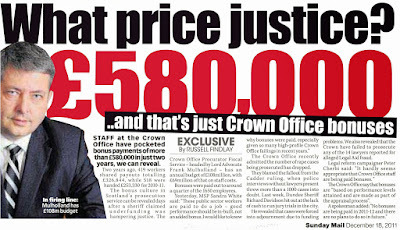 A Crown Office spokeswoman said: "We received a report in relation to two men aged, 60 and 57, in relation to an alleged incident in Paisley in 2008. After full and careful consideration of the facts and circumstances, Crown Counsel instructed there should be no proceedings in relation to this matter." Scotland’s Lord President, Lord Hamilton. 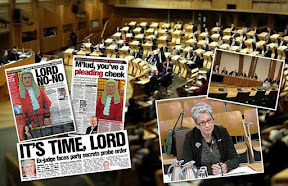 LORD HAMILTON, Scotland’s Chief Judge has written to the Scottish Parliament’s Petitions Committee informing MSPs of a slight softening of the requirements of McKenzie Friends or ‘lay assistants’ applying to assist unrepresented party litigants in Scotland’s Court of Session. 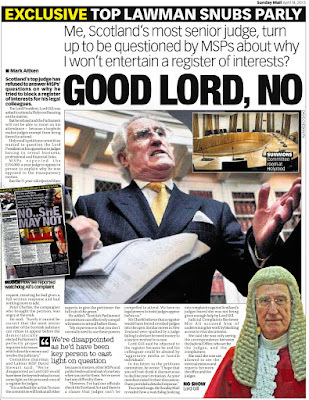 However while the changes proposed to the terms of who can be a McKenzie Friend in Scotland are welcome small steps, there are still a number of issues yet to be settled to bring Scottish Courts into line with the rest of the UK, after McKenzie Friends first came into existence in an English courtroom forty years ago. 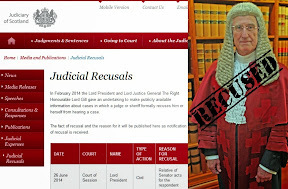 The changes, although minimal, are a retreat from Lord Hamilton’s previous plans to question those applying to be a McKenzie Friend whether they are related to the party litigant. It will now be the case, according to the Lord President the document which accompanies the application for lay support requires now only to state whether or not the supporter has a financial interest in the case and if so to set out what that is. The reference to case law in the English courts family division to support the right of a McKenzie Friend to charge for their services, reports that Mr Justice Munby, ruling over a case of costs arising from contentious contact and residence litigation between unmarried parents [N (A Child)  EWHC 2096 (Fam)] concluded the child’s father's McKenzie Friend "is entitled to charge, if he can find clients willing to pay his fees, at an hourly rate which can hardly be said to be extravagant when contrasted with the fees one frequently finds being charged to privately paying clients in family cases". 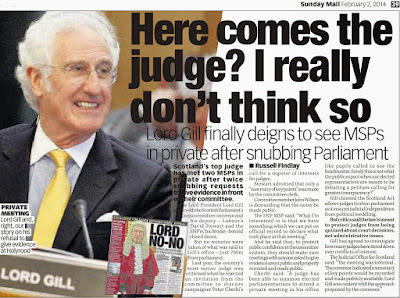 Court of Session judge Lord Woolman granted Scotland’s first civil law McKenzie Friend in late 2009. During the course of the Scottish Parliament’s consideration of the McKenzie Friend petition, one of Scotland’s longest running civil claims actions, M.Wilson v North Lanarkshire Council & Others (A1628/01), overtook events at Holyrood and introduced Scotland’s first civil law McKenzie Friend in the Court of Session, granted by Lord Woolman, making the decision to introduce McKenzie Friends to general use in the Court of Session and lower Sheriff Courts, a formality, albeit one taking the best part of a year to complete. I will report further on the McKenzie Friend issue when the Sheriff Court Rules Council publish more details on their draft rules and timescale for formal introduction. Scottish Legal Complaints Commission give clients a choice to authorise similar snooping powers. 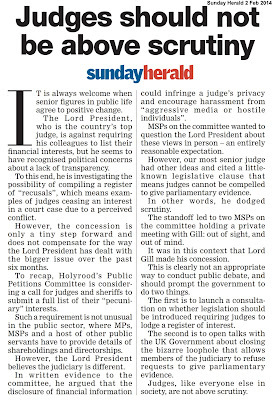 Curiously while the Law Society says it requires such a vague, open ended level of unprecedented access to the private lives of consumers before it will complete an investigation into conduct complaints against solicitors - access which apparently includes asking for criminal background checks, medical details and other private information on complainers themselves, the ‘independent’ Scottish Legal Complaints Commission offers complainers a choice to authorise whether or not those it approaches in connection with an investigation can disclose information, documents, files or related papers in order to investigate the complaint. The Law Society offers no such choice and claim they will not be able to complete an investigation without all of its terms being agreed to. Snooping Complaints Form : Sign this, and you give permission for the Law Society to snoop on every detail of your life, not just that of the solicitor complained against. 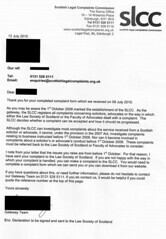 A senior official with one of Scotland’s consumer organisations, commented on the Law Society’s complaints form expressed dismay at the wording of several parts of the document, and agreed that ‘Item 2’ on the complaints form in its current wording allowed the Law Society unusual levels of access to the personal details & lives of anyone making a complaint against a solicitor. Shockingly, it transpires from details leaked by a legal insider, there have been numerous uses of private information apparently engathered by Law Society officials during the course of investigations into crooked lawyers, key information on the private lives of the complaints which has been used during Complaints Committee meetings to sway decisions in favour of the lawyer, quashing numerous complaints, many involving the most serious of offences. 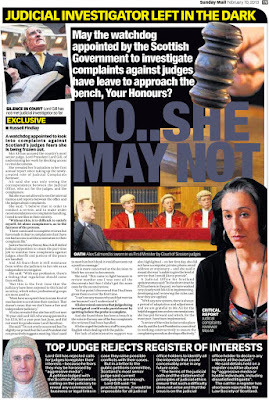 In several instances, it appears that Law Society Complaints Committees were even told of criminal background information on complainers, and members were asked to ‘find for the solicitor’ on the argument the complainer’s criminal background was of such bad character it merited letting the lawyer off the hook from the complaint. The legal insider, citing one example said : “We were told the complainer had a driving conviction for an SP30. I had to ask what that was as I had no idea. I was told "breaking the 30 mph limit". The complaint being considered in that case was in relation to the solicitor making a mess of the complainer's father's will. 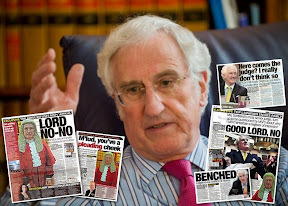 The solicitor's agent at the committee implied the complainer was of bad character as he had been convicted of the driving offence and we should find for the solicitor. Myself and a lay member said this information had no relevance to the complaint. 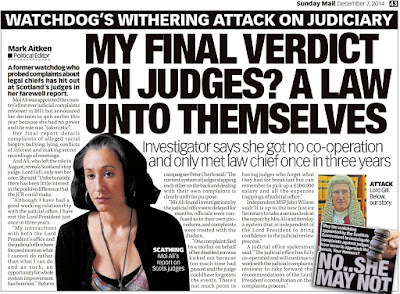 Even so, a decision was taken to find for the solicitor." In another instance, a Complaints Committee were informed the complainer had an assault conviction with a suspended sentence. Members were supposed to take this into account even though the complaint being considered related to the solicitor's mishandling of a property transaction. The complaint against the solicitor in this case was also quashed, yet the solicitor in question has faced and is currently facing several more complaints made by other clients. In another revealing instance, where it appears private medical information on a complainer was gained, either from the use of the form or from the solicitor who was the subject of the complaint, members of a Complaints Committee were told the complainer suffered from mental health issues and was undergoing treatment. Members were told his local NHS trust had confirmed this. A lay member asked why the committee were being told this and who had disclosed the information but his question was not answered. The complaint on that occasion related to contested fees for work the complainer said he had not instructed to proceed. 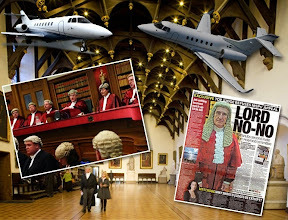 Law Society Committees have often been the scene of information gathered by Law Society snooping to save a crooked lawyer. 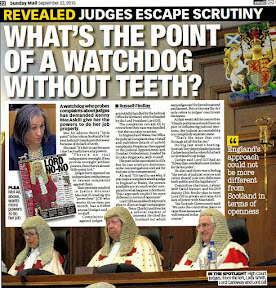 The Law Society’s desire to snoop on complainer’s backgrounds is of course, nothing new, as I personally found out in the early 1990’s when I was forced to make a complaint against Borders solicitor Andrew ‘Drew’ Penman of Stormonth Darling Solicitors, Kelso. 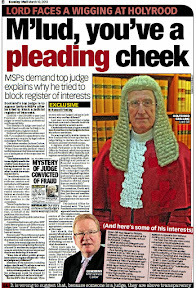 Thankfully, the Scotsman newspaper, under its previous ownership had reported extensively on the Law Society’s concerted attempts to thwart any prosecution of Mr Penman by using a similar smear tactic session against of false information relating to my bad character (a bad character of publicising the complaint in the Scotsman) as well as Mr Penman’s own marvellously long career in the law, to get Mr Penman off the hook from jointly ruining my late father’s estate with a crooked accountant Norman Howitt, currently of the JRW Group based in the Scottish Borders. 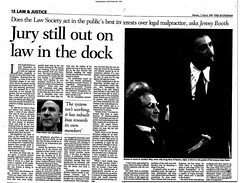 Law Society Chief Douglas Mill stepped in to block court action to reveal Law Society’s misuse of information back in the 1990’s. It was so important to the Law Society of Scotland I was not able to find out exactly what was said at the Complaints Committee and that I be prevented from taking judicial steps to reveal the Law Society’s method of halting the prosecution of Andrew Penman, the then Law Society Chief, Douglas Mill stepped in to block my legal aid application for legal action against the Law Society over its protection of Penman and misuse of information, which was widely reported in the Scotsman again, and later became evidence in two Scottish Parliament inquiries into regulation of the legal profession in Scotland, which eventually led to the creation of the Scottish Legal Complaints Commission. A client of a solicitor who is currently attempting to file a complaint with the Law Society of Scotland today branded the form an attempt at intimidation to stop people making complaints against their lawyers. Another client who has approached the Law Society over the content & wording of the form has so far been refused an explanation over its terms, from both the Law Society of Scotland and the Scottish Legal Complaints Commission. 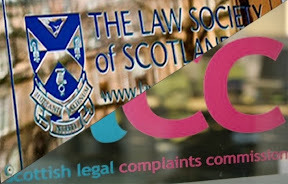 The Scottish Legal Complaints Commission have been asked for their reaction to the revelations and the terms of the Law Society Complaints Form. The SLCC were also asked if they monitor who the Law Society approach as per item 2 of the complaints form, and what type of information is engathered by the Law Society. While no reply has yet been received I have been informed a response will be forthcoming, which will be published in an update to this article. For now, I would advise clients who are complaining against their solicitors to the Law Society of Scotland, not to sign the Law Society complaints form until it is reworded to be more specific in detailing who exactly the Law Society can approach seeking information on consumers. 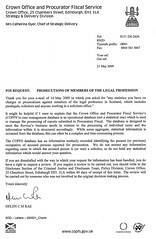 Also, since the Law Society of Scotland is currently exempt from the transparency of Freedom of Information legislation, clients who make complaints against their solicitors to the Law Society of Scotland should ask to be made fully aware of each & every organisation, body or individual the Law Society approaches concerning their complaint, along with the Society giving to clients, a full disclosure of any information they have gathered on the complaint. 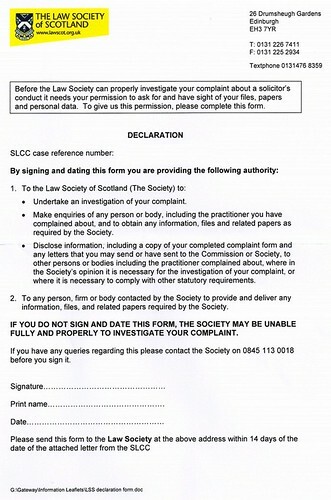 As I note the solicitor who is being complained against (and their legal agent, along with other bodies such as the Legal Defence Union) appear to be entitled to see all the information the Law Society accumulates on a complaint, therefore the client making the complaint should have equal access & disclosure of all information engathered regarding the complaint. Complaint about conduct or service - use the Conduct and Service Complaint Form (Microsoft Word format, 146k). Complaint about handling - use the Handling Complaint Form (Microsoft Word format, 138k). Guidance on completing the complaint form - Complaint Form Guidance (PDF, 130k). UK Home office announces plans to review spying laws. SCOTS once again may miss out on reforms to justice & civil liberties announced yesterday by the UK’s Home Secretary Theresa May, to scale back local council spying powers, as the Scottish Government revealed today it has no plans to review the use of the much hated snooping laws granted to local authorities in the Regulation of Investigatory Powers (Scotland) Act 2000, which have been used by Councils up and down Scotland to spy on everything from fly tipping offenders, late payers of Council Tax, parents of schoolchildren, critics of local public services, and even journalists who have reported on local authority scandals. *the use of the Regulation of Investigatory Powers Act 2000 (RIPA) by local authorities, and access to communications data more generally. While many of the issues which are to be subject of the much hailed review were originally intended to protect the UK against terrorism, the inevitable ‘mission creep’ of anti terror powers, and who could use them saw local councils widely abusing snooping powers granted to them under the Regulation of Investigatory Powers Act 2000 (applicable to England & Wales) and its Scottish Equivalent : Regulation of Investigatory Powers (Scotland) Act 2000. The RIPSA legislation was introduced to regulate the surveillance of a person or persons and to regulate information obtained from third parties when the subject of the activity is not aware of either the surveillance or information gathering. Many campaigners have welcomed the UK Government’s commitment to review and potentially scale back the spying powers which have led to such incidents as local councils snooping in refuse bins local councils snooping in refuse bins and parents being spied on over placements of their children in local schools parents of schoolchildren being spied on over placements and in Scotland, on, among others, rogue traders, antisocial neighbours and bill posters. A spokesman for an openness campaign group said the Scottish Government’s stance was ‘not viable’ in the face of the coalition government’s plans to scale back spying powers in England & Wales. A parent whose family was subject to RIPSA surveillance powers over a long running battle concerning the placement of his child at a school in a major Scottish city, who was cleared after nearly two years of investigation & harassment by his local authority also criticised the Scottish Government for its lack of will to review the snooping powers in Scotland. 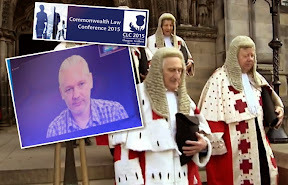 He went onto comment that even after winning his long, bitter battle against his local council, after his family had been followed, photographed, had their waste-bins emptied & searched, he placed little trust in any independent oversight of Scottish public bodies who are allowed to use RIPSA to spy on the public, describing ‘independent’ regulation of Council spying powers as “a joke”.